IBM® Workload Deployer provides a solution to creating, deploying, and managing workloads in an on-premise or private cloud. It is rich in features that allow you to quickly build and deploy virtual systems from base images, to extend those images, and to customize them for future use as repeatable deployable units. IBM Workload Deployer also provides an application-centric capability enabling rapid deployment of business applications. By using either of these deployment models, an organization can quickly instantiate a complete application platform for development, test, or production. 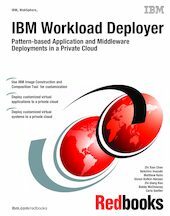 The IBM Workload Deployer uses the concept of patterns to describe the logical configuration of both the physical and virtual assets that comprise a particular solution. The use of patterns allows an organization to construct a deployable solution one time, and then dispense the final product on demand. patterns are composed of an operating system and IBM software solutions, such as IBM WebSphere® Application Server and IBM WebSphere Virtual Enterprise. patterns are constructed to support a single application workload. The IBM Workload Deployer is shipped with a set of pre-loaded virtual images and virtual patterns. These images and patterns can be used to create comprehensive and flexible middleware solutions. They can also be cloned and customized to suit your specific needs. This IBM Redbooks® publication looks at two different aspects of customizing virtual systems for deployment into the cloud. First, it explores the capabilities of IBM Image Construction and Composition Tool to build and provide highly customized virtual images for use in virtual system patterns on the IBM Workload Deployer. Next, it looks at the virtual application capabilities of the IBM Workload Deployer, including those capabilities that allow you to deploy enterprise applications and database services to the cloud. It also introduces the IBM Workload Deployer Plugin Development Kit, which allows you to further extend the capabilities of the virtual application patterns.